This is a family favourite and it has been passed down through the generations. It is a ‘must have’ Christmas recipe. The day before you make the pudding, if time allows, put the sultanas, raisins, currants, cherries and mixed peel in a large mixing bowl. Drizzle with the brandy and mix well. Cover and leave to soak overnight. Next day add in the flour, breadcrumbs, sugar, almonds, salt and spices to the soaked fruit and mix well to combine. Add lemon rind, juice, melted butter and eggs and mix well. Cover with two well greased pieces of greaseproof paper making sure there is a fold across the middle. Place a double layer of tin foil, secured with string, or alternatively the lid of the pudding bowl on top. Place the pudding bowl into a large sauce pan half filed with water. Bring the water to the boil and then reduce to a very gentle simmer. Simmer for six hours, making sure that the water does not boil off. Top up with some additional water if required. After the cooking time has elapsed remove the pudding from the water and remove the lid and grease-proof paper and allow the pudding to cool down completely. When cold, re-cover as before with fresh paper and store till needed. 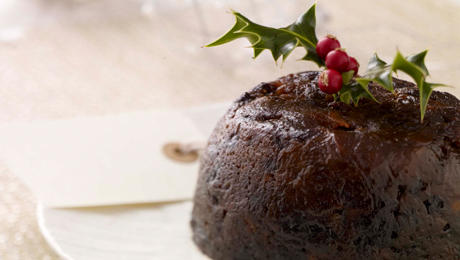 On Christmas morning, you can reheat the pudding either in the microwave or you can steam for in a large saucepan of water (as per the cooking method) for a further hour until thoroughly heated through. Stunning little pudd. Thought it looked dry and a bit underwhelming but, 6 weeks later, it's bursting with flavour such that you'd scrape away the cream. And light as a feather (as such!). Won't be buying a Christmas pudding again. I look forward to making this pudding.